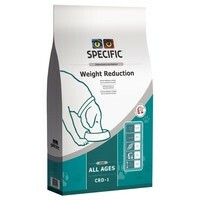 Specific Weight Reduction CRD-1 Dry Food for Adult Dogs is a complete dietetic pet food ideal to be used as part of a weight loss programme for adult dogs needing to lose weight. Low in fat and calories, but high in fibre and protein, the diet will leave your dog feeling full and satisfied, whilst still losing the extra weight. Specific Weight Reduction also contains additional L-Carnitine which helps move fatty acids into your dogs’ cells to be burned for energy; meaning the weight loss comes from fat rather than lean body mass. Wheat, Fish Meal, Powdered Cellulose, Maize Protein, Oats, Yeast, Beet Pulp, Hydrolysed Poultry Protein, Potato Protein, Fish Oil, Minerals, Vitamins and Trace Elements, Rice, Psyllium Husk, Methionine, L-Carnitine.